As you've probably guessed from my review of La La Land, I'm a sucker for light-hearted films (I watched Sing Street last night). Something about the way they look at the world through an idealist's lens makes me feel warm and fuzzy inside, and lets me treat the movies as a break from the real world. But with Sundance just around the corner, and dozens of really hard-hitting films in the lineup (I'm looking at you, Cries from Syria), I've decided to not only think more critically about movies I watch, but to think more critically about which movies I watch. Straying away from my normal fodder, I decided to watch a tough movie, one that I've heard whispers about since Mountainfilm 2016. Black and white works really well with this film. 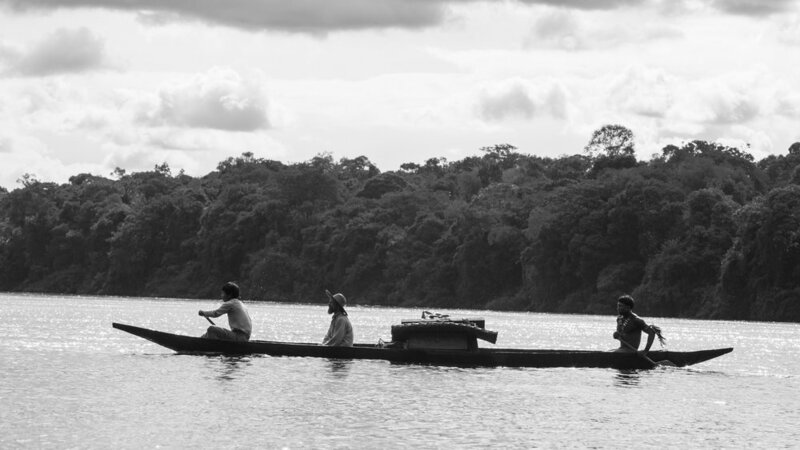 Embrace of the Serpent (Guerra) is not a movie about the Amazon. It's not a movie about race. It's not even really a movie about imperialism. No, this movie is about scars, and how they both physically, mentally, and culturally damage entire peoples for generations. Based on the travel journals of ethnologist Theodor Koch-Grunberg and biologist Richard Evans Schultes, Embrace of the Serpent centers on the shaman Karamakate. Approached first by a sick Theo, and 40 years later by a curious Evan, a young and old Karamakate lead these Western scientists down the Amazon, in search of the mythical, all-healing yakruna plant. Told as parallel narratives, this cursed stretch of the river creates nightmares for young Karamakate, which still strike fear in his self 40 years in the future. Along both journeys, Karamakate struggles with the effects of imperialism and the desire to save both his people and himself, a desire which culminates in an ending so bizarre and unearthly that I still can't really describe what happened. As I mentioned above, this movie is really about scars. No perpetrator has left more scars along the Amazon than the dreaded rubber barons, Between 1879 and 1912, rubber plantation owners in Brazil brutally murdered thousands upon thousands of natives. Even as recently as 1963, rubber has been the cause of disgusting and horrific violence among the indigenous communities in the Amazon. Nilbio Torres' Karamakate is as fierce a warrior as I've seen on screen. In Embrace of the Serpent, such is the horror of the rubber barons that at a mere glimpse of the oozing, criss-crossing scars of the rubber trees, Karamakate acts as if he has just seen the clawmarks of demons. Other atrocities exist along their hellish river journey, for certain. Cultural genocide in an imperialistic Capuchin monastery, where children are forced to abandon their "pagan" language for Spanish, or face torture (as indicated by grisly looking stockades and rusty hanging hooks in their play area), is one of the most striking horrors, especially when the effects of its oppression are seen 40 years later. As a quick aside, this is why as a Christian, I often struggle with foreign missions. Historically, mission work has been more imperialism than evangelism. From serving as the shock troops of Spain's colonial agenda, to oppressing and suppressing young natives, mission work has often been nothing more than a form of cultural genocide. Even in modern day, the influx of short-term missions trips to developing countries only serves as a way for us white folk to feel better about our faith, and often does more harm than good. That's why I encourage people to donate time and money to local causes, where the impact can be seen and felt. So if you're feeling up to it, check out the Salt Lake Rescue Mission or Missoula Alliance Church's Foster Care program. Back to the movie: Even with the cultural genocide and atrocities committed by these monks, rubber reigns as the supreme monster of the Amazon. As a side note, costuming is very well done on this one. The scars left behind by the rubber barons are as jagged and visceral in the minds and culture of their victims as they are on the trunks of the rubber tree. None more so than Karamakate, whose fierce young shaman is swallowed by grief and turned into a shallow, hollow shell of his former self. Embrace of the Serpent is a hellish, Heart of Darkness style road trip, a beautiful descent into the madness which haunts Karamakate, and the whole Amazon Basin. I'd highly suggest watching it, and fittingly, it's streaming for free on Amazon Prime. Ha. Ha.